Traceability is an important process for the automotive industry in particular. This article contains information on implementing traceability solutions, including how to trace products, in-process using KEYENCE code readers and laser markers. Our engineers put together this case study about the IM Instant Measurement System, a device capable of measuring 99 dimensions in just 3 seconds. It showcases different inspection scenarios to help you to visualise how it could benefit your own processes. Wanting to learn more about Laser Marking? Lasers can be invaluable tools across a range of applications, but only if you are aware of their full capabilities. Browse through our laser marking guide and learn about the basics, all the way up to complex principles to see how they can benefit your own processes. The GT2 Series High Accuracy Contact Sensor was designed to be able to measure down to 1 μm accuracy, supports multiple communication protocols and its rugged housing ensures the sensor is dustproof, watertight and oil-resistant, even in the harshest environments. · When do I need a high-speed camera vs standard speed? · What size and resolution would suit my application best? · Is a high pixel count necessary? Why do Engineers choose Profile Measurement Systems? · What are the typical applications profile measurement systems can solve? · What are the advantages of using a blue laser over a red laser? 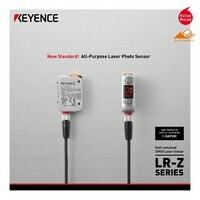 The LR-Z Series combines a CMOS image sensor with a sophisticated laser light source which enables stable detection that is not affected by the colour or angle of the target. Download the catalogue for all the details. Is your Laser Marker Safety up to Standards?